• Internet celebrity Grumpy Cat set out on a multi-city publicity tour aboard a bus. • The Internet Cat Video Festival played to sellout crowds in cities across the nation, sometimes drawing 10,000 spectators who gathered, concert-style, before giant projection screens to watch cats do what cats do. • In the classic Monopoly board game, Hasbro replaced the long-used iron token with a shiny metallic cat. • The book, “I Could Pee on This: And other Poems by Cats” perched high on National Public Radio’s bestseller list for eight months. 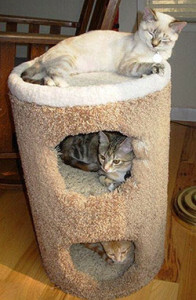 No surprise, then, that the number of domestic cats in the U.S. continues to soar. The most recent figures by the Humane Society of the United States show 95.6 million felines residing in American homes, compared to 74 million in 2012. But wait! Cats don’t pull sleds, fetch newspapers, hunt with us in the woods or guard our homes. So why are these creatures – whose eyes glow in the dark as they prod us to get up and feed them RIGHT NOW – so popular? And what a plus it is. Purring has been linked to lowering human stress and strengthening hearts, according to “The Healing Power of Cat Purrs,” by the data-visualization website Daily Infographic (http://dailyinfographic.com/the-healing-power-of-cat-purrs-infographic). In the 20 years that Farnsworth has been treating small animals, she has witnessed an evolution: More pet owners are living with more than one cat; and more men are cat owners. Bryan Slinker, dean of WSU’s veterinary college, has no problem admitting that he and his wife, Kathy, own four cats – or explaining their virtues. Ah, yes, cat terms – space when they want it, love when they ask for it and food when they crave it. Self-centered, you say? 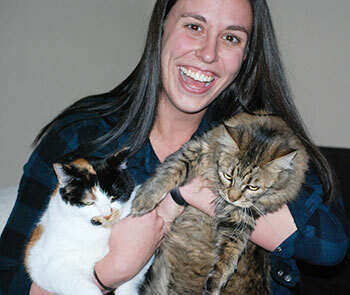 Adrienne Berthot is a cat lady of the Y generation. In her second year of veterinary studies, the 24-year-old is a member of WSU’s student chapter of the American Association of Feline Practitioners. She is also the owner of two cats. 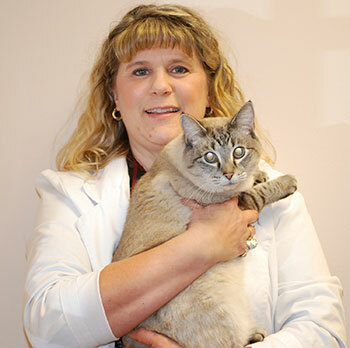 “She’s definitely one of the most, how should I say – enthusiastic – students that I’ve had in my classes when it comes to cats,” said veterinary professor Steve Hines. “Absolutely. I adore cats!” said Berthot, whose apartment caters to their comfort, complete with scratching posts, perches and fluff balls on strings. Unlike the crazy cat lady stereotype of a frumpy matron shuffling about in a bathrobe caked in cat hair, Berthot moves between Lola and Leila like a dancer clad in jeans and a sweatshirt. “It’s so nice to come home from a full day of classes to these small furry creatures that have so much personality and I think really care about me,” she said.